In next week’s issue of Famitsu magazine, a special code will be offered that will allow fans to download a Ghirahim inspired costume for use in the “My Fairy System”. This is one of the newest element to Hyrule Warriors Legends, where players will be able to grow and develop their fairies to become quite effective partners to use in battle. Each will have their own special abilities and attributes depending on how you have “raised” them. 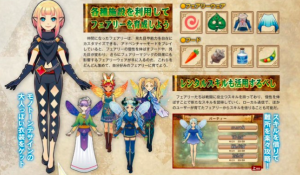 The exclusive costume will supposedly not be available anywhere else and will allow for a special skill that will increase your fairies magic effects. Stay tuned for more details next week!